From feasting with the locals to travelling back in time at ancient monuments, or just lounging on the beach… here are the best things to do in Izmir, Turkey. A laid-back city on Turkey’s West Coast, Izmir is in many ways Istanbul’s opposite. Istanbul bustles with imported voices, faces, and visitors from around the globe; in Izmir, you’ll mix with locals whose roots in the area go back to ancient times. Istanbul offers a dizzying array of sights, colours, and sounds; in Izmir, the silent azure sea can soak up all your attention for hours. Don’t worry, though, there are plenty of fantastic active things to do in Izmir, too. With only three days in the city, my Izmir itinerary was packed so full and I didn’t get to see and do half of the things I wanted to. Izmir seems to be built for a slow pace, and I longed to spend more time relaxing in picturesque locations with a coffee or a glass of Turkish wine in hand. If you’re heading to Izmir, leave yourself plenty of time not just to see the sights but also to chill in the charming city centre. Here are 11 fantastic things to do in Izmir. These are just some of the amazing ancient monuments you should check out, as they really are amongst the best places to visit in Izmir. Any list of things to do in Izmir has to start at the ancient monument right in the city centre. Surrounded by hillside residential neighbourhoods, bustling market streets, and tall commercial buildings, Izmir Agora is just a part of the everyday landscape for most residents. Inside the Agora grounds, the ruins of a Roman-Greek marketplace transport you back to the days when Izmir was an important stop on the Silk Road. 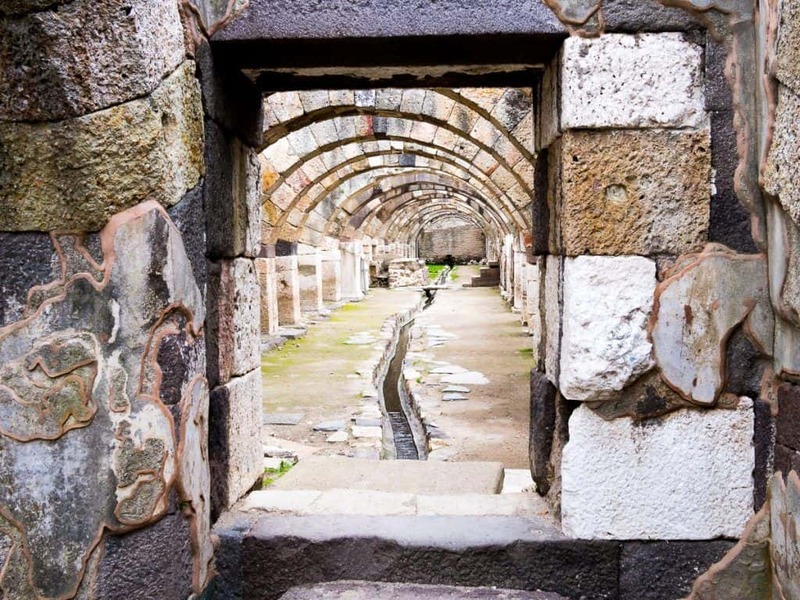 Ancient water channel under the arches at the Izmir Agora. The archways on the lower floor of the 2,000-year-old marketplace are still intact and the same fresh water that supplied the ancient market still bubbles out of fountains and runs through a channel along the floor today. This place was built to last! 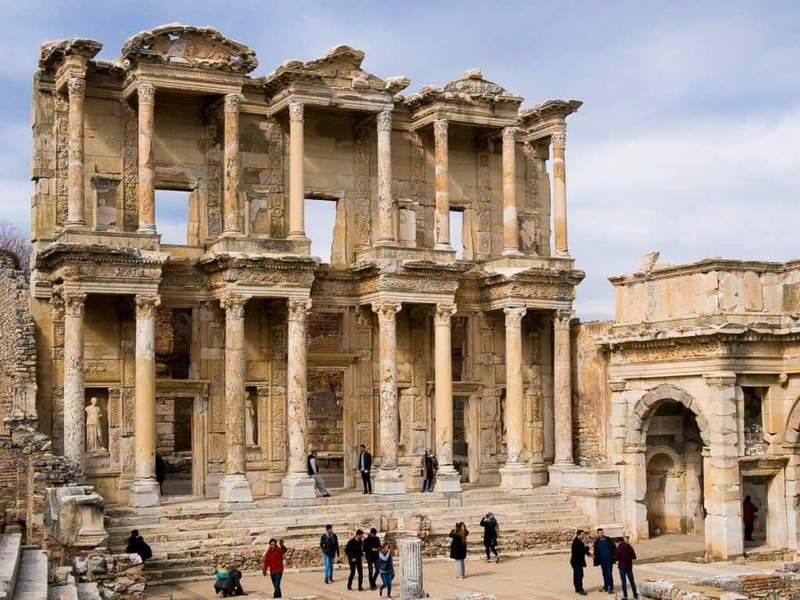 The ancient Roman city of Ephesus was once a hugely popular stop on the Silk Road and it is now one of the most popular things to do in Izmir, welcoming almost 2 million visitors a year. In ancient times, people from all over the world sailed to the port to stock up on exotic spices and fruits, visit the talented Turkish cloth-makers, or just soak up the flavour of the multicultural city. The Celsus library in Ephesus used to house 12,000 scrolls. 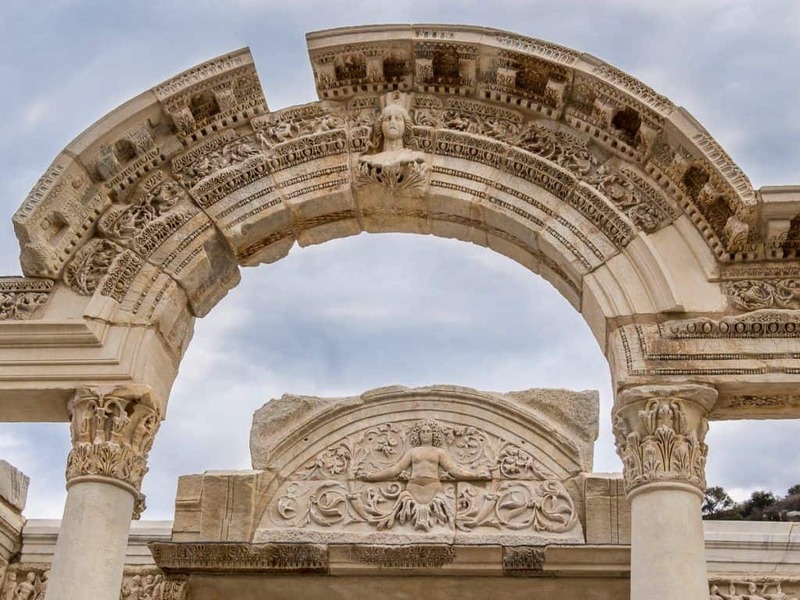 The restored Celsus library, constructed with a double-wall technique to preserve the 12,000 scrolls that were housed there, is a great reminder of the value we humans have always placed on knowledge and learning. 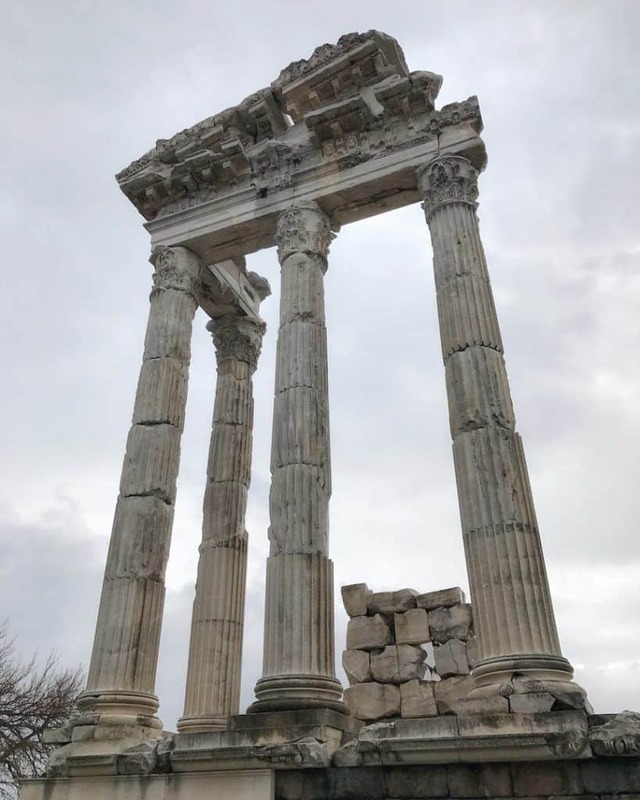 High on a hilltop overlooking the modern town of Bergama sits the Pergamon Acropolis, an ancient Greek city that was a seat of power in the 2nd Century BC. The height and size of the Pergamon Altar in Izmir is just stunning. The site is best known as the location of the Pergamon Altar, a colossal construction with soaring pillars. backpFor me, the highlight of Pergamon was the world’s steepest ancient theatre that hangs dizzyingly off the hillside overlooking the town of Bergama. This Greek-Roman spa town is at the top of many traveller’s bucket lists for its white travertine terraces, created by the natural hot springs that flow down the hillside. 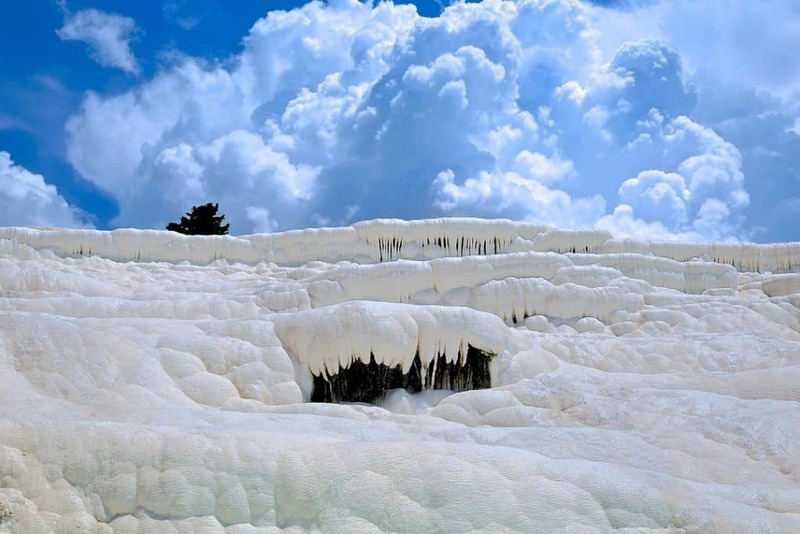 The Pamukkale pools have been in use for thousands of years. After exploring the ancient temples of Hierapolis and walking along the narrow pathway through Pamukkale, spend some time bathing in the hot mineral pools just as the Romans once did. In the welcoming central bazaar in Izmir, marketeers smile and shout, inviting visitors and locals alike to inspect their wares. Unlike in many marketplaces around the world, Izmir’s marketeers are happy to chat, even if it’s obvious you won’t be buying a pound of sardines or a traditional Turkish wedding costume. There’s plenty on offer here for the curious foodie, too. Invest a few lira for the chance to watch the happy candy vendor expertly twirl his vats of liquid sugar onto a stick for you. Sweet, sticky Turkish delight is on offer in every colour of the rainbow while salty sour olives range from deep black-purple to bright green. A visit to Kemaraltı Market is definitely one of the tastiest things to do in Izmir. To experience the local culture, there’s nothing quite like getting lost in the back streets of a small town, chatting with the curious locals, and discovering your own hidden gems. An hour or two wandering Bergama is a perfect introduction to the local way of life. Make sure to leave a little time to explore Bergama before you head up the hill to the Pergamon Acropolis. 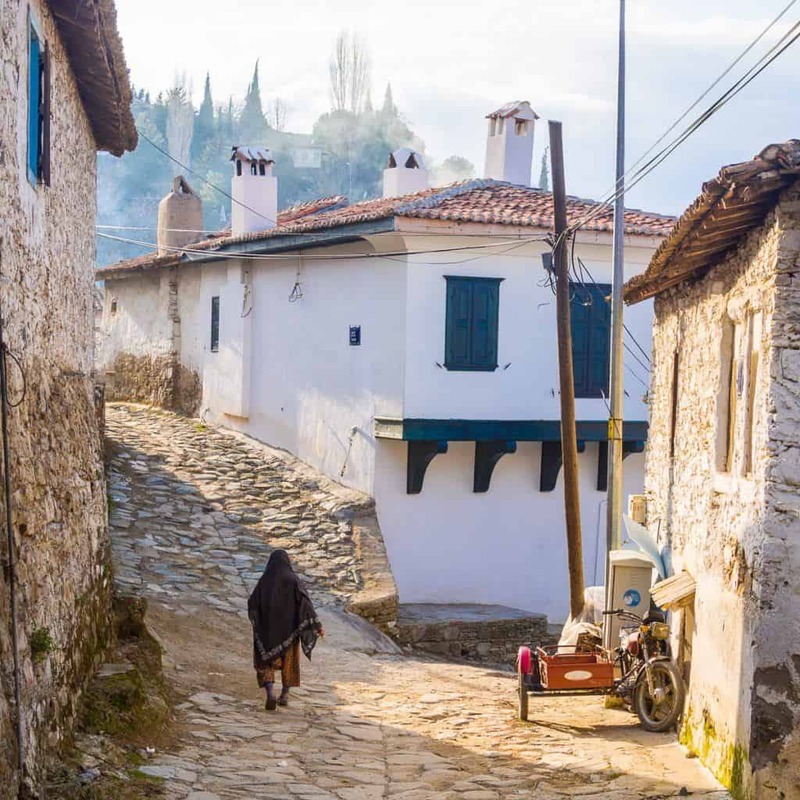 The narrow streets of Şirince hide secrets behind every curve and the crumbling old houses are an architecture-obsessed photographer’s dream. In the town centre, friendly shopkeepers wave hello and proudly show off their artisanal products. Climbing up to the highest parts of the village is like wandering back in time. Tiny elderly women in traditional dress call to each other from open doorways, bread bakes in arcing stone ovens, and cats lounge on every available surface, soaking up the afternoon sun. 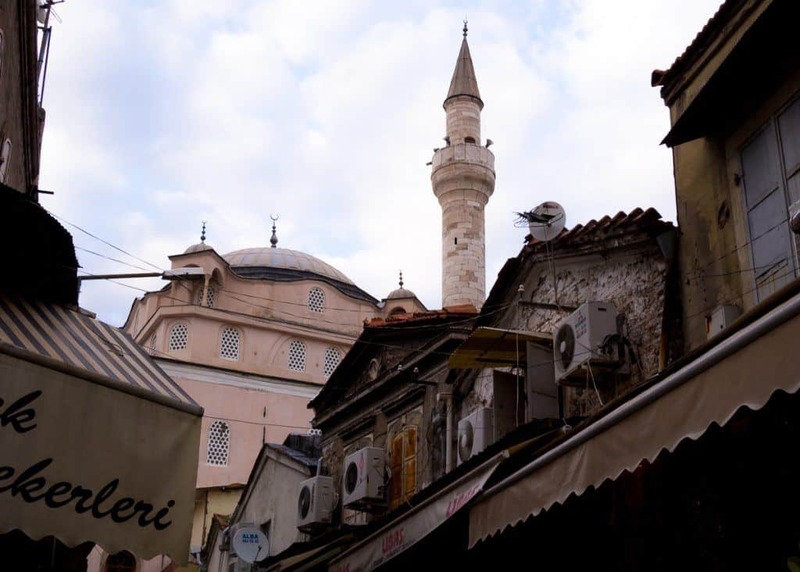 Leave plenty of time to wander the streets of Şirince. The hillsides around town beckon to anyone adventurous enough to explore them. Give Şirince a few days – a few hours here is not nearly enough. When people sit down to eat in Turkey, there’s no such thing as a quick bite. The dishes start small, with shared plates of olives and crusty breads to snack on. Don’t eat too much of this. At Turkish meals there is plenty more to come! But that’s just the warm-up. Soon the table is filled with melt-in-your mouth roasted eggplant, grilled whole fish, savoury greens smothered in sour cream, potato and lamb stew, green salads with shredded cheese, fresh sweet peppers and radishes, smoked eggplant dip with creamy melted cheese… it’s an endless exotic parade. When you’re sure you can’t eat another bite, out comes another bottle of Raki, a clear anise-based alcohol, served alongside an overabundance of tempting Turkish sweets. 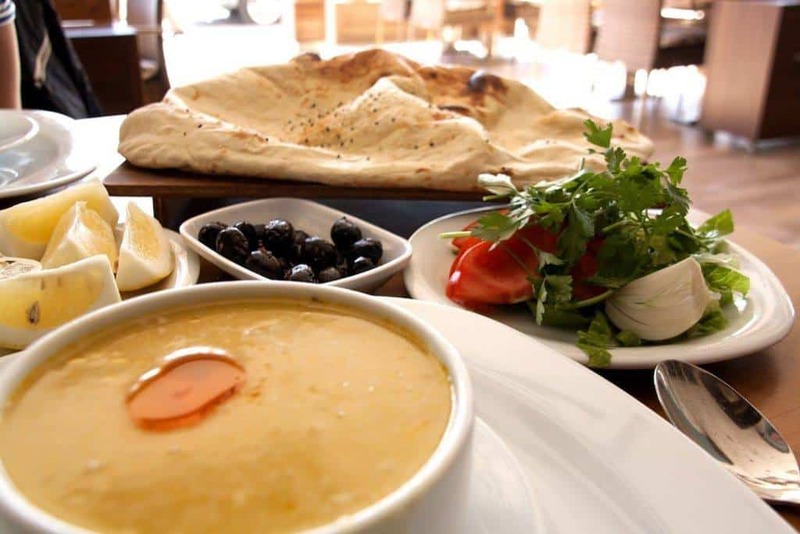 You’ll never leave a dinner table in Izmir feeling less than achingly full! In Turkey, coffee isn’t a drink — it’s an event. The thick brew takes time to simmer and steep, so the wait is filled with conversation over tiny squares of Turkish delight and delicate pieces of dried fruit. 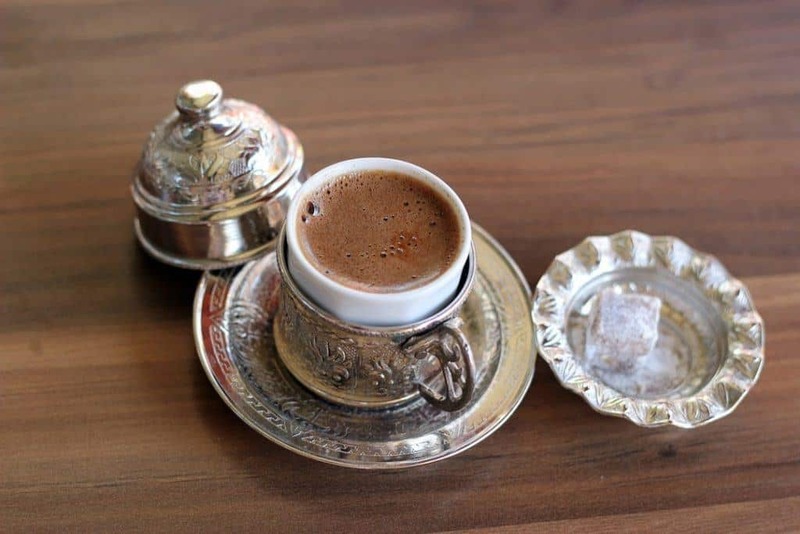 Sip Turkish coffee carefully, there are grounds at the bottom! Turkish coffee is made by adding coffee grounds and water to a small pot and then it’s left to simmer for several minutes. Sugar is added during brewing, since the coffee is poured straight from the pot into a cup, with no straining or filter. Don’t stir your coffee and be sure to leave a little in the bottom of the cup, or you’ll end up with a mouthful of bitter coffee grounds. Arranged in a u-shape around a sheltered bay, Izmir has more than its fair share of coastline. One of the best free things to do in Izmir is to take a walk on the long shoreline promenade, soaking up the sunshine. Visit in the evening for the bustling seaside bar and restaurant scene. For an amazing day at the beach, though, it’s better to head out of the city to one of the dozens of white sand beaches dotted around Çeşme, Dikili, and Pamucak. If kicking back on the beach is not your thing, enrol in surfing, kitesurfing, or sailing school. 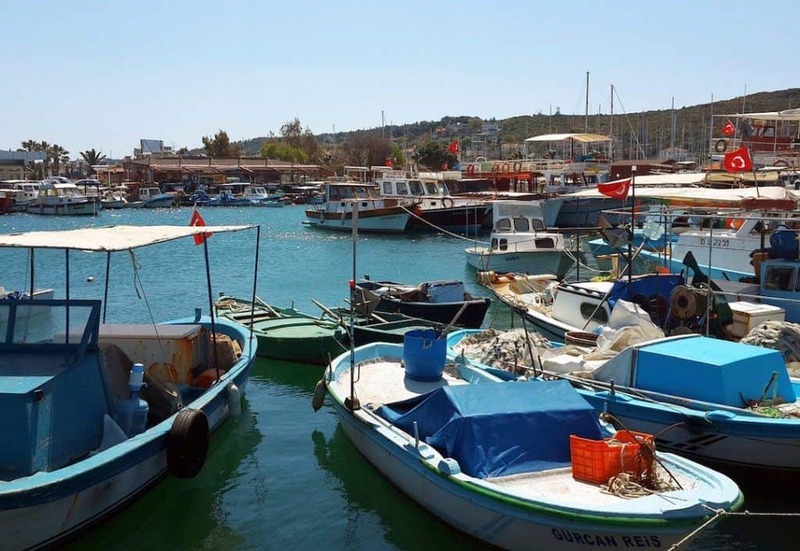 There are plenty of things to do in Izmir, Turkey, especially on the water. There are plenty of calm waters near Izmir that make the perfect training ground for water sports novices. Try one of the surf schools in Alaçatı if you’re a beginner. For one of the most adventurous things to do in Izmir, seek out the rougher coastal waters at Pırlanta where strong winds and wild waves hit the shore for at least six months of the year, making it a hot destination for surfers from around the world. In three short days in Izmir, I was completely charmed by the city and its historic surroundings. If this list of things to do in Izmir has you convinced, too, check out my guide to the best places to stay in Izmir for all budgets. Jane was a guest of Visit Izmir for this trip but all opinions are her own and she truly loved this small Turkish city by the sea. Hey, we're Jane & Stephen of My Five Acres. We're passionate about living an adventurous life – 'cause, why live a boring one? We've lived in six countries and have camped, biked, trekked, kayaked, and explored in more than 50. Stop by, say hi, and grab our free ebook 101 Travel Tips for Mindful Adventurers. Turkey is safe! Turkey is home to fairy chimneys and hot air balloons, Roman history and kebabs, a world wonder and 16 UNESCO World Heritage sites! In 2017 Turkey will also host many international travel conferences, as it aims to draw more visitors to this historic country. I’m going to Turkey end of this year. Your post helps so much! What a great experience. Very Impressive – Question. How did you communicate to these places. Did you rented a car ? Or was everything walking distance? if you did rent a car – did you find trouble in parking ? Thank you so much. You can rent a car if you like or get a local taxi. At the time of Jane travelling there, she was a part of a group and hired a driver. I don’t think parking would be an issue at all All the best. You can find public busses, coaches to major touristic destinations and reasonably priced local tours, e.g. Izmir to ephesus 7 hour trip with a tour guide $22 pp. You’ll find the locals very helpful. Can you tell me which tour guide you used? I’ve looked at the tour companies and they are all in the E80-E100 range – that is per person to join a small group tour. I’m travelling alone to IST, Cappadocia and Izmir in September and I cannot find any tours for less – would love your contact for these. True to its name: Fantastic. I loved your blog post. Adorned with very natural photos and colours. A must-read article before visiting Western Turkey and Izmir city.